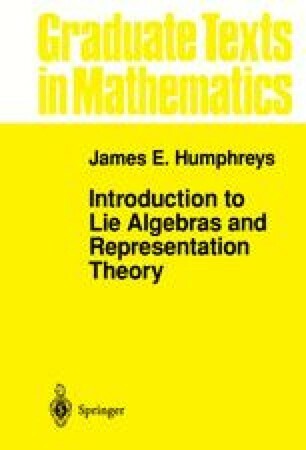 In Chapter I we looked at Lie algebras over an arbitrary field F. Apart from introducing the basic notions and examples, we were able to prove only one substantial theorem (Engel’s Theorem). Virtually all of the remaining theory to be developed in this book will require the assumption that F have characteristic 0. (Some of the exercises will indicate how counterexamples arise in prime characteristic.) Moreover, in order to have available the eigenvalues of ad x for arbitrary x (not just for ad x nilpotent), we shall assume that F is algebraically closed, except where otherwise specified. It is possible to work with a slightly less restrictive assumption on F (cf. Jacobson , p. 107), but we shall not do so here.